Italia adiectis iis, in quas usque ad Augusti tempus Italiae nomen propagatum est, regionibus, Sicilia, Sardinia, Corsica quales fuerunt ante adventum Gallorum. 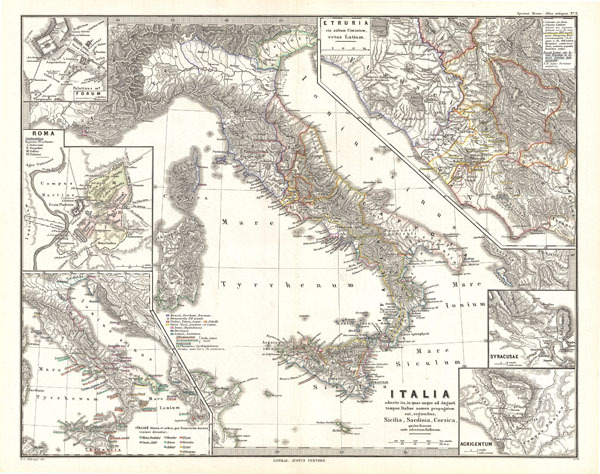 This is Karl von Spruner's 1865 map of Italy, Sicilia, Sardinia and Corsica under Augustus Caesar, at the start of the Roman Empire. Spruner depicts the entire country of Italy as a whole, with a detailed inset of Etruia, a region of central Italy. This area makes up what today are the regions of Tuscany, Latium, Emilia-Romagna and Umbria. Spruner also includes 5 smaller insets showing (counterclockwise): the Forum, Rome, the voyages of various Heroes, Agrigentum, and Syracusae. Each inset includes its own legend or scale. Map shows important cities, rivers, mountain ranges and other minor topographical detail. Countries and territories are designated with colored. The whole is rendered in finely engraved detail exhibiting throughout the fine craftsmanship of the Perthes firm. Rumsey 1626.010. Phillips (atlases) 3288. Espenhorst, J., Petermann's Planet, p. 397-404. Espenhorst, J., Andree, Stieler, Meyer & Co., p. 148.